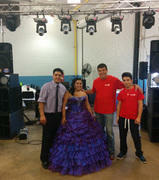 We offer DJ service with the best of Latin music including bachata, cumbia, tribal, merengue, etc. as well as popular music in English. Whether your event is small or large, we can customize the sound and lights to your needs. Or if you have a DJ but just need to rent audio or lighting equipment, call us and we can bring everything you need to put on a great show. We can even deliver and set it up for you! Browse the selections below and click on the image or "More Info" link for additional information and to make a reservation.